That officers should fall in line & obey them- is their desire. The honest ones, who don't confirm, are in the line of fire. No recognition for a job well done, no one to congratulate. DK Ravi faced consequences dire & earned such a fate! The honest and skilled are rewarded- getting killed. Elected representatives have no guilt; are thrilled? Who are they trying to fool by claiming it's suicide? We demand a CBI inquiry- impartial & bonafide. System must turn over a new leaf; want a change massive. He was a lamp; They turned off the light like child's play. Can we ensure hundreds of lamps shine & show the way? Is it too much to ensure that duty & truth win & honesty thrives? Note- Request you to sign THIS PETITION demanding CBI INQUIRY & justice for DK Ravi. so funny that anyone is thinking that its suicide.. hope the truth will come out and the culprits punished. But, the loss is ours. We lost an honest IAS officer. Very well written....such a sad incident...in our country there is no respect for the honest. Only cheats, frauds, liars, corrupt ppl r well rewarded. SHAME. It is sad to see corruption rife in so many countries with so much pressure to stifle criticism that lives are being lost. This unfortunately is happening throughout the world and the average person can only look on with horror. It is so important that matters such as this are given a voice. Powerful words; obviously it's not a suicide. But you know what, Anita. Even this will be brushed under the carpet, like everything else. But yes, signing the petition is the least we can do for this honest man. It's tragic, and obviously not suicide. Hope the truth is revealed on further investigations. nicely penned down with an impact! Thats so gross. Thanks for highlighting this news on ur blog.. m shocked!! So many unjust things happening in the world. Very well written. It's so tragic. This world is becoming a hell for good and honest people. A great tribute to him. Brilliant job, Anita. As far as CBI inquiry is concerned, do you think that impartial CBI inquiry possible in today's time? A well written and compelling statement on behalf of DK Ravi! I do not know the whole story behind it, but corruption is corruption and we have it here in this country too. Those who dare to speak out against the wealthy and powerful are often silenced. But we know right from wrong, and we all need to stand together for what is right, that it the only way things can change. Such honest and particularly courageous officers are extremely rare and hard to come.by.While my heart goes out for his family,I hope the truth would finally come out of the investigations. Read in the news, and was shocked. I agree life is not fair esp to those who want to turn things around for the good! I wish his soul rests in peace and yes, will sign the petition. Thanks for linking Anita with an imp message! Your posts are always awakening. its a shame....and it hurts sometimes that we live in a system like that with our eyes closed and hands cut completely helpless. it raises fierce anger in me soul-sis. Anita, thank you for your wonderful words and for linking in to my blog! Great tribute to a humble man. Its the death of truth and honesty. Justice has committed suicide and no inquiry or investigation would bring back a good patriot. Sincere condolences to his family. Such a sorry state of affairs in our country. Death is the certificate given to all the honest countrymen in this Cruel World! How sad! It fills all of us with anger. World is cruel to men like him. The last line is so powerful. Indeed the honest suffer the most! Bad people try to shake the hope in the common people. But, there is a limit to the patience of common man and he stands out definitely! 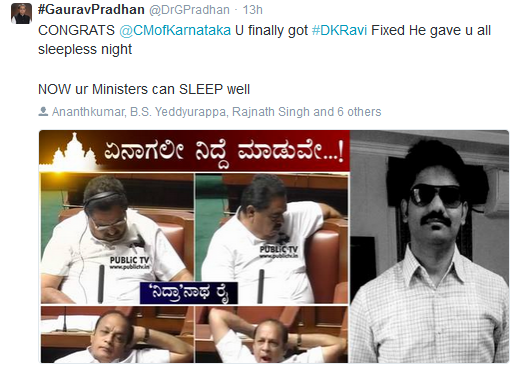 I am touched by the love of common people to Ravi... I salute his great soul!